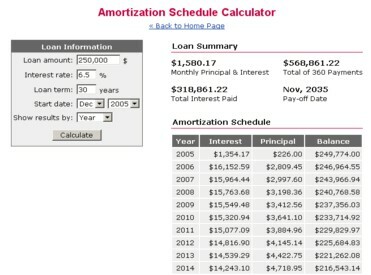 Amortization Schedule Calculator also known as an amortization schedule calculator - lets you estimate your monthly loan repayments. It also determines out how much of your repayments will go towards the principal and how much will go towards interest. Simply input your loan amount, interest rate, loan term and repayment start date then click "Calculate". This loan amortization calculator should only be used to estimate your repayments since it doesn't include taxes or insurance.